Pep Guardiola says Manchester City's win at Bournemouth was "one of the best performances we've ever played" as the champions overcame injuries to Kevin de Bruyne and John Stones to go two points clear at the top of the Premier League. The champions lost De Bruyne and Stones either side of the break before Riyad Mahrez - on for Belgian De Bruyne - scored the only goal of the game early in the second half. "[It was] an incredible performance - one of the best performances we've ever played," said Guardiola. "We didn't concede one shot on target, we were committed at set-pieces defensively, every time we lost the ball we had three or four guys going to recover the ball. "It was incredible how well they played today - the way they helped each other was fantastic." It was a second 1-0 win in the space of four days for City, who once again dominated possession but were forced to be patient against dogged and defensive opponents. They only created one clear-cut opportunity in the first half, when David Silva met De Bruyne's low cross but could only side-foot wide. Seconds before the break they suffered their first injury blow when De Bruyne went down unchallenged and immediately signalled to the bench that he wanted to come off. It was the same scenario at the start of the second period, with John Stones walking off the field to be replaced by Vincent Kompany. Despite those setbacks, City continued to push forward and deservedly took the lead after 55 minutes. Charlie Daniels failed to properly clear Bernardo Silva's pass, the ball falling to Silva who teed up Mahrez to fire home at Artur Boruc's near post. The Bournemouth goalkeeper could possibly have done better, but made up for it with a series of impressive stops to keep the score at 1-0. The 39-year-old showed great athleticism to tip Sergio Aguero's lofted long-range effort on to the bar before pushing Mahrez's header away from point-blank range. Bournemouth offered little as an attacking force in reply, failing to have a shot at goal or force a single corner. City's win puts the pressure back on title rivals Liverpool, who can return to the summit with victory over Everton in the Merseyside derby at Goodison Park on Sunday. Man City win - but at what cost? The sight of a pumped-up Guardiola passionately hugging all his players on the pitch at the final whistle highlighted the importance of this win in an increasingly fascinating title race. The result was just reward for City's patience and determination, as they stuck to their possession-based approach even though they failed to break through a packed defence early on. The champions had 82% possession, forced 14 corners and had 23 shots at goal in a win that was a lot more comfortable than the scoreline suggests. The victory came at cost however, with Guardiola confirming De Bruyne came off with a hamstring injury while Stones was substituted as a precaution. With Fernandinho and Aymeric Laporte already sidelined, even a squad as talented as City's is being stretched. Guardiola will have been delighted therefore with the impact of Mahrez, who was ineffective against West Ham in midweek but was much improved here. The City boss was also boosted by the return of Gabriel Jesus, who came on as a late substitute after three weeks out with a hamstring injury. Both are likely to play a key role in the coming weeks, with this game the first of five matches across three competitions in a hectic March for City as they seek an unprecedented quadruple. Bournemouth manager Eddie Howe responded to Wednesday's 5-1 thrashing at Arsenal by switching formation to a back three, with wing-backs Nathaniel Clyne and Charlie Daniels effectively making it a back five. The plan was clear - defend deep in numbers and limit the space for City's forward players in dangerous areas. The Cherries have the worst defensive record outside the bottom three, so it was an understandable approach against the most prolific side in the division. The formation worked perfectly in the first half, with Nathan Ake superbly marshalling the defence alongside Chris Mepham and Jack Simpson, the latter making his first Premier League appearance of the season. That approach obviously needed changing once Mahrez put the visitors ahead, but Howe waited until the 75th minute before bringing on an extra forward in Lys Mousset. The tactical change had little impact, with the Cherries failing to test Ederson with a single shot on target throughout the 90 minutes. Howe will hope the imminent return of top-scorer Callum Wilson after six weeks out with a hamstring injury will boost his blunted attack as they seek the points the Bournemouth manager still feels they need to banish any lingering fears of relegation. Manchester City manager Pep Guardiola speaking to BBC Sport: ""We created a few chances. People should understand how difficult it is to attack 11 players [who are defending]. Thanks to the players, they are absolutely incredible. "We demand a lot of the players without giving them the time to rest physiologically, that is why it is incredible. No matter what happens this season they deserve my admiration. "We have competed in the Community Shield and the Carabao Cup, today we are leaders in the Premier League and we're in a good position in the last 16 of the Champions League. "I have no complaints, no regrets. It's important that after what happened last season, we never give up, to do what we have done is incredible and today is a special moment. "We compete in all competitions, playing every three days, no recovery, so you need a quality and depth of squad. When a team play with that spirit and desire with everybody committed, it doesn't matter. Hopefully they [injured players] can come back as soon as possible. Aymeric Laporte, we think, is getting better." Bournemouth manger Eddie Howe speaking to BBC Sport: "It is difficult - you want to be competitive and that was the way for us to make the game tight, show toughness and mentally hang in. The only frustration is their goal was ugly which is very unlike them, so very unlucky. "It wasn't the plan to be so without the ball but they rarely make a mistake. Technically they were very good. You are waiting for a mistake so you can counter and they made very few. That limited the chance for us to do what we are very good at. "Nathan Ake did very well today, the most experienced of the back three, led by example with his commitment and endeavour. With young Jack Simpson and Chris Mepham playing alongside him too, that is hugely positive for the future, looking at the age of these three. It is a good sign." Manchester City's 100% record in eight games against Bournemouth is the best in English top-flight history. Bournemouth have never beaten Manchester City in 14 previous league meetings (D2 L12). Manchester City have kept a clean sheet in six of their past eight Premier League games, including in each of the past four, conceding just three goals in total. Bournemouth failed to record a shot against Manchester City, the first time they have failed to register an attempt in a Premier League game. Bournemouth recorded their lowest possession figure in a Premier League game against Manchester City (17.9%), with the club averaging 48.9% in the competition. Manchester City's David Silva has provided an assist in each of his past three Premier League away games, as many as in his previous 19 on the road. Five of Riyad Mahrez's six Premier League goals for City have come away from home. Next up for Bournemouth is a trip to bottom side Huddersfield next Saturday (15:00 GMT). Manchester City host Watford the same day in the evening kick-off (17:30 GMT). Match ends, Bournemouth 0, Manchester City 1. Second Half ends, Bournemouth 0, Manchester City 1. Raheem Sterling (Manchester City) wins a free kick on the left wing. Foul by Chris Mepham (Bournemouth). Corner, Manchester City. Conceded by Nathan Aké. Substitution, Manchester City. Gabriel Jesus replaces Sergio Agüero. Riyad Mahrez (Manchester City) wins a free kick in the defensive half. Foul by Ryan Fraser (Bournemouth). Attempt missed. Sergio Agüero (Manchester City) right footed shot from outside the box misses to the left. Assisted by Ilkay Gündogan. Attempt missed. Vincent Kompany (Manchester City) left footed shot from the centre of the box misses to the left. Assisted by Kyle Walker following a corner. Attempt missed. Kyle Walker (Manchester City) right footed shot from outside the box misses to the left following a corner. Attempt saved. Riyad Mahrez (Manchester City) header from the right side of the six yard box is saved in the top centre of the goal. Corner, Manchester City. Conceded by Adam Smith. Joshua King (Bournemouth) is shown the yellow card. Kyle Walker (Manchester City) is shown the yellow card for a bad foul. Foul by Kyle Walker (Manchester City). Attempt blocked. Riyad Mahrez (Manchester City) left footed shot from the centre of the box is blocked. Assisted by Ilkay Gündogan. Foul by Oleksandr Zinchenko (Manchester City). Lys Mousset (Bournemouth) wins a free kick in the defensive half. Substitution, Bournemouth. Diego Rico replaces Nathaniel Clyne. Substitution, Bournemouth. Jordon Ibe replaces Jack Simpson. Offside, Bournemouth. Nathan Aké tries a through ball, but Lys Mousset is caught offside. Attempt saved. Sergio Agüero (Manchester City) right footed shot from long range on the left is saved in the top centre of the goal. Assisted by David Silva. Attempt blocked. Bernardo Silva (Manchester City) right footed shot from outside the box is blocked. David Silva (Manchester City) wins a free kick in the attacking half. Delay in match Nathan Aké (Bournemouth) because of an injury. Attempt missed. Riyad Mahrez (Manchester City) left footed shot from outside the box misses to the left. Hand ball by Adam Smith (Bournemouth). Substitution, Bournemouth. Lys Mousset replaces David Brooks. Corner, Manchester City. Conceded by Chris Mepham. Attempt saved. Sergio Agüero (Manchester City) right footed shot from the centre of the box is saved in the bottom left corner. Assisted by Raheem Sterling. Foul by Raheem Sterling (Manchester City). Nicolás Otamendi (Manchester City) is shown the yellow card for hand ball. Hand ball by Nicolás Otamendi (Manchester City). Corner, Manchester City. 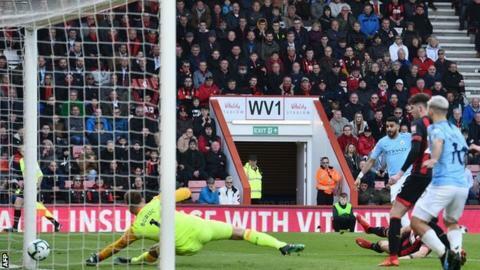 Conceded by Artur Boruc. Attempt saved. Raheem Sterling (Manchester City) right footed shot from the right side of the box is saved in the bottom right corner. Assisted by Bernardo Silva with a through ball.